A Valley Without Wind has always been a tantalizing prospect with noble ideas, held back by a troubled visual presentation. Having gone through multiple artistic shifts, the final product still looks hastily cobbled together, a clashing collage of color rather than a cohesive piece of art. Truly this is a game that follows the fabled "gameplay over graphics" school of thought, given that the interactive element of A Valley Without Wind is as thoughtful and polished as the aesthetics are confused and jarring. There's a huge amount of detail and activity going on under the garish hood, and there's a lot to applaud. However, it does ask the question -- when does "a lot" become "too much"? 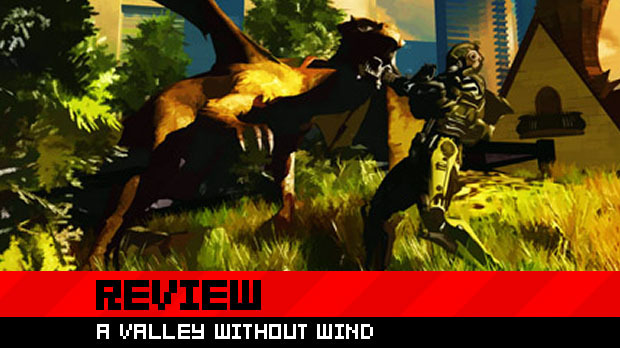 A Valley Without Wind is light on story, throwing players into the aftermath of a mysterious cataclysm that has caused time to fracture and the world to become overrun with monsters. The clashing time period is something of an attempt to justify the strange art style, where ox-shaped wooden tanks and straw huts coexist with icy mountains, robot skeletons, and gleaming futuristic towers. From the player character to the monsters and buildings, nothing looks like it quite belongs, and while the narrative may have its reasons, the result is nonetheless awkward and alienating. Perhaps even more alienating are the constant tutorial messages and menus that assail the player as soon as the game begins. From the outset, you'll be given magic spells, wooden planks to build upon the environments, and more concepts thrown together than you could reasonably remember. A Valley Without Wind tries to do an incredible amount at once, and while it looks impregnable at first, the game's ambitious concepts have been stitched together with a surprising fluidity. Combining two-dimensional platforming with roguelike elements, crafting systems, city building and roleplaying, A Valley Without Wind is a game about acquiring power, exploring a vast, randomly generated continent, and completing missions in order to rebuild civilization. Savvy players will see quite clearly how the likes of Castlevania, Metroid, NetHack and even Minecraft have informed the game, and yet the resulting cocktail of inspiration is nowhere near as messy as it should be. There's a lot to take in at first, inflicting a first impression that betrays how simply everything works together. 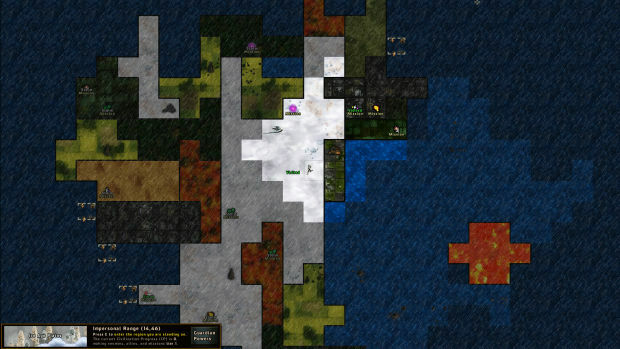 From a world map, players can visit a large number of sectors separated by a grid pattern. 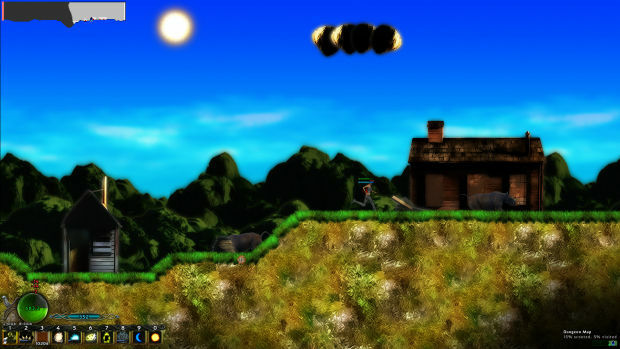 Once entered, each sector is presented as a sidescrolling platform level consisting of surface areas, subterranean dungeons, and buildings. The surface is a simple collection of outdoor environments, littered with beasts and the aforementioned buildings which can be entered to look for loot or secret missions. Dungeons are found beneath the surface, accessed through potholes or special entrances, and they contain yet more secret missions, as well as various ores and gems to be used for crafting. Along the way, large boss monsters can be encountered, and deeper dungeons containing creatures that are considerably more powerful than the player. Rather than gain power through leveling up, characters raise stats by finding upgrade stones and strengthen their abilities by crafting them. 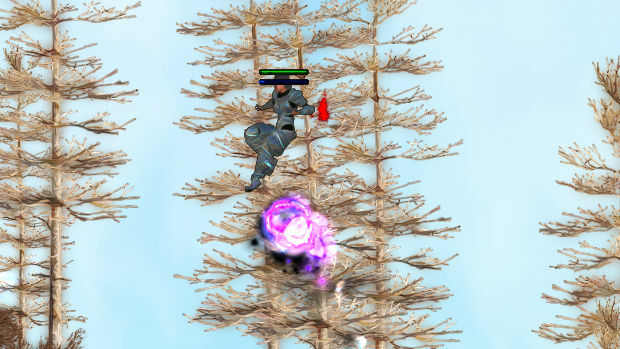 Using special orbs gained through missions alongside raw materials collected in the environment, a number of spells can be created with up to five tiers of strength. Mapped to mouse keys and numerical buttons, players have a ridiculously huge arsenal at their disposal, from elemental projectiles to area-of-effect blasts and more defensive skills. Some crafting items need to be unlocked by performing specific tasks, such as entering certain rooms in certain environments, and spells can only increase their level if players have completed enough missions to raise the "tier" of the entire continent. Completing five official missions will raise the continent's tier, strengthening monsters in the world while allowing for the creation of greater spells. Secret missions don't increase the tier, allowing the player to gain rewards without driving up the challenge. These missions are fairly straightforward, but tend to put a unique spin on the platforming fundamentals. 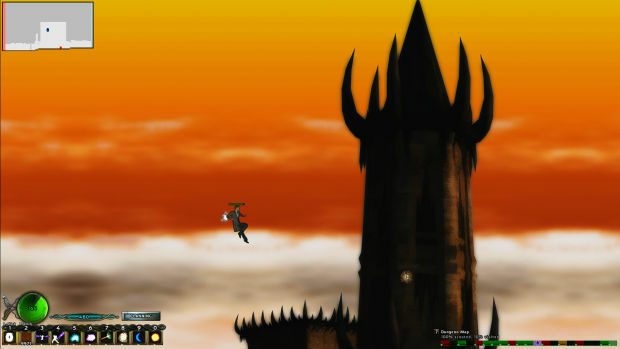 Such objectives involve completing a stage without taking any damage, or clearing a tower full of powerful boss creatures. There's a ton of missions to beat, all sorts of secrets to uncover, and a central hub town that can be improved by rescuing survivors and establishing buildings. With randomly generated levels and characters that can permanently die before leaving vengeful ghosts behind, A Valley Without Wind promises a lot of gameplay and a consistent dynamism that keeps things fresh. However, the game betrays its own ideals in that, as much as it attempts to keep things fresh and interesting, it does so by sticking to a rigid formula that ultimately becomes tiresome long before the content runs dry. Over the many, many, hours of gameplay on offer, everything essentially boils down to the same thing. You enter a level, you point and click at a humble selection of indistinguishable enemies, you pick up the loot, and repeat. With only snatches of story provided as rewards for hidden puzzle rooms, there's nothing compelling to drive the player forward outside of getting more stuff, and once the stuff has been gotten, all that's left to get even more of it by repeating the same weary tasks you did to get the last batch of increasingly obsolete stuff. It's acquiring power for power's own sake, in a world where the acquisition of said power really isn't very rewarding. Everything in A Valley Without Wind seems to be playing for time. From the unintuitive menus, sluggish and messy inventory system, and increasing reliance on backtracking and repetition, there's a distinct feeling that things were designed specifically to waste hours upon hours in a shallow bid for longevity. Boasting so many concepts that work together so well, it is a shame that the best A Valley Without Wind can do with all its ideas is to repeat itself to the point where players will likely get bored long before they make any real progress. Tragically, the shameless time wasting betrays what is, at the heart, a very nice little game. Mechanically, A Valley Without Wind is clever and enjoyable, boasting combat that not only requires fast reflexes but a mind for strategy. With the ability to erect blockades and quickly construct platforms, players are encouraged to choose positions wisely when fighting opponents. Furthermore, every available spell adheres to its own physical rules. 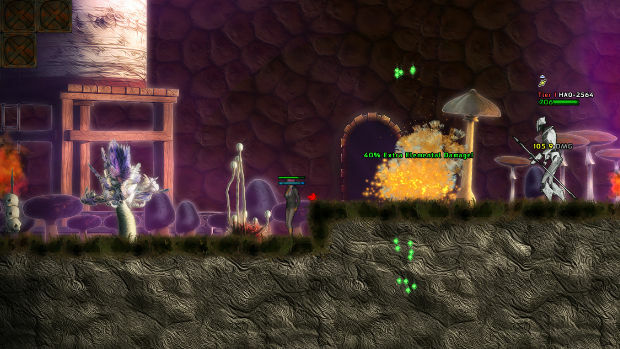 Some of them are fast, some of them are slow, some of them glide along walls, some bounce off enemies to score more hits. Learning the unique properties of each spell, and exploiting their interactions with the environment, is a satisfying and rewarding experience. The biggest problem is that every positive aspect of the game carries with it an element of self-defeat. There's a huge world to explore, but the random generation leads to fairly unexciting and predictable level designs. There's a ton of spells to find, but you'll soon find the one or two that work for you and spam them incessantly. There's a ton of objectives to meet, but meeting them means performing a handful of increasingly tedious tasks. The permanent death lends an element of tension, but only because if you lose a character, you'll need to waste yet more time collecting upgrade orbs to get the next one in fighting condition. A Valley Without Wind strains at the seams with big ideas and great intentions, it's just tragic that the delivery is ironically restricted and feels as small as the world is big. After all is said and done, though, one thing needs to be said in Without Wind's favor -- it is solid where it counts, and it's fun while it lasts. The "lasting" is a case of your own personal patience, but until you reach that breaking point -- which will likely be long before the developer expected -- you ought to find plenty to applaud. Your time will likely end more with a resigned sigh than a triumphant sense of accomplishment, however, because this is simply one of those games that grind you down until it becomes far more interested in itself than you are. For those with an eye for something unique, A Valley Without Wind definitely deserves a portion of the time it demands. The fact that its contrasting tropes and bleeding genres work together so well is well worth checking out, and while the visual presentation is odd, there is at least a keen sense of humor and some gorgeous music to keep things ticking along. There's much to recommend, but only to a specific clientele, and only for so long. If you've got a mind to grind, and you don't mind being asked to run around in circles, there's something in A Valley Without Wind for you, for however long it takes for you to get tired. And you will get tired.